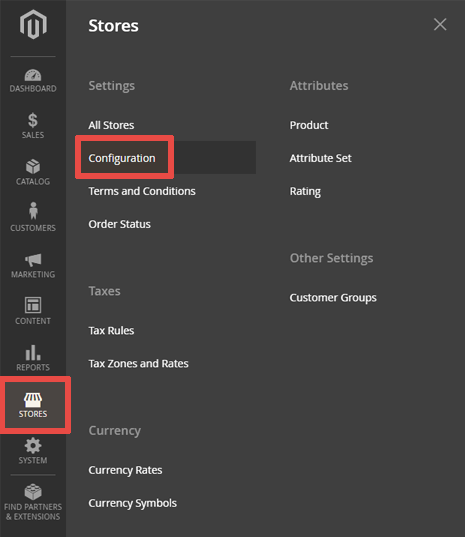 Open the «Stores» → «Configuration» section inside the Magento 2 backend. 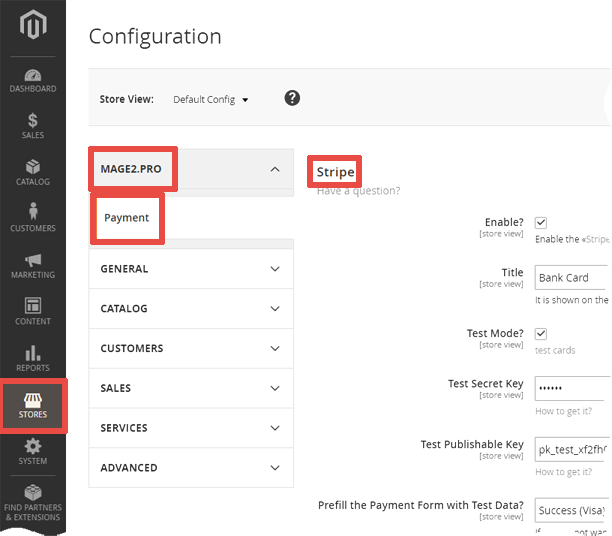 The Stripe extension settings are located in the «Mage2.PRO» → «Payment» → «Stripe» section. Using this checkbox you can enable or disable the extension. The test mode allows you to test your integration thoroughly before taking it live. All of Stripe's features are available in test mode, though no live charges using the card networks can be created. In test mode, credit card transactions are not processed through the actual card networks and only our test card numbers can be used. Test mode allows you to fake having a Stripe balance in order to test (fake) transfers. Alternative payment methods such as Bitcoin have a more nuanced flow in live mode, with more steps required than those in test mode. Disputes also have a more nuanced flow in live mode, and a simpler testing process. Your API keys are available through the Dashboard. If you cannot see your API keys in the Dashboard, this means that you are not an administrator for the account, and have only Read & Write or Read Only access. You will need to contact your Stripe account's administrator to request access to view the API keys. The publishable key is meant solely to identify your account with Stripe, it is not a secret. Keep your secret API key confidential. Your account's secret API key can perform any API request to Stripe without restriction. This URL is used to notify your store about events that happen in a Stripe account. Set it in the webhooks settings section of the Dashboard. Before going live, test that your webhook is working properly. This option defines the currency which will be used to interact with Stripe. An exact currency picked from the dropdown here. A customer is regarded as new, if he does not have any order in the «Completed» or «Processing» state. The 3 actions are available: Authorize, Capture, and Review. Stripe supports separately authorizing and capturing money on cards. It’s like two-phase commit for payments. This makes some new payment flows possible—most notably, capturing funds only when an order is ready for shipping. There are some caveats: occasionally, a bank will show an authorization as an actual charge. As such, using this in cases where the customer doesn’t expect to be charged can be confusing. It’s worth thinking carefully about your use-case. Stripe does not charge any fees on uncaptured charges, and fees after you capture are the same as any other charge. It will be displayed in the Stripe web interface alongside the payment. If you use Stripe to send automatic email receipts to your customers, your receipt emails will include the description of the payment(s) that they are describing. You can use some variables in the description. An arbitrary string to be displayed on your customer's bank card statement. This may be up to 22 characters, may not include <>"' characters, and will appear on your customer's statement in capital letters. Non-ASCII characters are automatically stripped. Stripe supports adding metadata to the charges. Metadata is for your use only: it isn't shown to customers. Through metadata, you can associate a meaningful to you information with Stripe activity. Any metadata you include will be viewable in the Dashboard (e.g., when looking at the page for an individual charge), and will also be available in common reports and exports. As an example, your store's order ID can be attached to the charge used to pay for that order. Doing so allows you, your accountant, or your finance team to easily reconcile charges in Stripe to orders in your system. Stripe does not require it, but you can require it from your customers. Prefill the cardholder's name from the billing address? If checked, Magento will require the billing address. It is the default Magento behavior. If unchecked, Magento will not require the billing address, and even will not ask for it. The Stripe payment method will not be shown to a customer with a lower order amount. The Stripe payment method will not be shown to a customer with a higher order amount. The 3 options are available: No, Whitelist, and Blacklist. Customers from which countries can (or can not) use the method?